If you really want to experience history with a capital H, then drop into the Domschatz (St Stephen’s Cathedral Treasury). You don’t have to be a Christian (or even religious) to appreciate the rarity and importance of the items within. NB: The treasury is temporarily closed. Not sure when it will reopen (I was told perhaps late 2019). The Last Supper by Albrecht Dürer. The Domschatz has fragments of the tablecloth. The five or so treasury rooms are in the upper echelons of Stephansdom cathedral, so a wonderful feature is the exclusive views you get across the building’s interior down to the main altar and sarcophagus of Frederick III. For once, the word “treasures” might not be quite big enough to describe the items on display. Most of the exhibits are the kind you’d imagine being lifted reverentially by grave robbers or pirates in some Hollywood blockbuster. I half expected Indiana Jones to come sweeping in to carry off a golden chalice for storage in that famous US government warehouse. Some treasures are historical in nature, such as a 15th-century triptych, 17th-century vestments, and even a cannonball from the second Turkish siege. I liked the long-handled spoons from 1679, designed (presumably) to allow priests to keep their distance when administering the sacrament during the plague. Then there are the relics. You can’t help be impressed by the collection, whatever you might think of the authenticity. It includes, for example, three thorns from the crown of thorns worn by Jesus Christ on the cross, a fragment of the tablecloth from the Last Supper, and the body of St Valentine. Dozens of incredibly ornate reliquaries display bone fragments and similar from the saints. The free guide leaflet (available in English) gives interesting details on selected items and rooms, but there is no information or even meaningful labels for the vast majority of relics. Unfortunately, much is left to your imagination. Reminder: the treasury is temporarily closed at the moment. The Stephansdom treasury is typically open from 9 am to 5 pm, Monday to Saturday. It cost €6 for an adult ticket when I visited. The Stephansdom all-inclusive ticket also covers entry. Oh, and if the treasury sounds like your kind of thing, then you should consider the Dom Museum, too. That headline sounds like there should be a coastal map with an X marked on it. 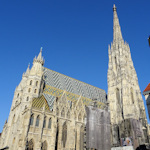 Anyway, see the main Stephansdom article for travel information. The lift up to the treasury is a rather inconspicuous cubicle, immediately on your right before you even get completely through the main cathedral entranceway. Wait (or ring the bell) if nobody is there. The attendant might be delivering people up to the top. *I accept no payments from websites to talk about them in an article. However, some like to give me a small "finder’s fee" if a visitor follows my links and then buys something at their website. Such text links are marked with a *. I try not to let this affect my objectivity (I link to vastly more attractions and services that pay no finder's fee).